This page features links to organizations and businesses in the area of Athens, Ohio, that support the develop of sustainability in this area. There are two general groups. The first are sustainability-oriented entities that most directly and extensively support sustainability, and the second are sustainability-friendly entities that have significant aspects supporting sustainability. Each section is subdivided into further sections. This site certainly is not complete; please feel free to make additional suggestions. This category includes businesses and organizations whose activities primarily center around sustainable objectives. 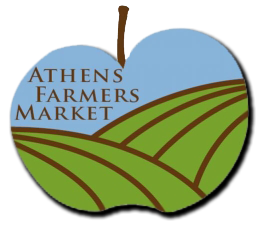 The Athens Farmers Market operates on Saturdays year-round from 9am-noon and on Wednesdays, April through December 9am-noon. It is strictly for sale of locally-grown foods, plants, animals, and products developed from them. There are many organic and other natural farmers there, including meat producers of various kinds. Casa Nueva is a restaurant, and Casa Cantina is a bar, both housed together. They specialize in using local organic produce in their food. They also make their own line of salsas and other specialty items. The Village Bakery and Cafe sells local products as well as their own, and uses local produce in their products. They also act as a pickup site for Good Food Direct. The Village Bakery also owns Della Zona Pizza next door and the Catalyst Cafe in the Athens Real Estate Company building on West Union Street. The Farmacy is a natural foods grocery store that also has a substantial supplements line and a lunchtime cafe. Crumb's sells at the Athens Farmers Market, and through other outlets, including Seamans Supermarket on West Union Street and Kroger on East State Street. Their emphasis is on natural, whole-grain baked products of a wide variety. Integration Acres specializes in harvesting, processing, and selling native pawpaw fruit, as well as products made with native spicebush and ramps. They also process black walnuts. Rich Gardens regularly sells at the Athens Farmers Market, its primary outlet. Sassafras Farm grows produce naturally, no chemicals, but is not certified organic. Ed regularly sells at the Athens Farmers Market and to local food businesses. Far Corner Farm sells through a number of outlets, including Good Food Direct. It is not strictly organic, but uses natural methods. Five Springs Farm Landscaping and Nursery has a nursery with a variety of stock for sale, as well as being a general-purpose landscaping business with a specialty in stonework. Third Sun Solar specializes in designing and installing renewable energy systems, with a special interest in photovoltaics. A division of Dovetail Construction Company, Inc., specializing in design and repair of solar homes. Specializing in open spaces management and sustainable site management. The Athens Conservancy is a nonprofit of a type known as a land trust, dedicated to protecting sensitive land and important ecosystems within Athens County and surrounding counties. The Buckeye Forest Council is a statewide organization dedicated to the preservation of Ohio's forests and other natural lands. CFI is an NGO that supports local food production, and which sponsors Good Food Direct and seed-saving and seed swaps. The Hocking River Commission is not associated with the Hocking Conservancy District. The HRC is a nonprofit that is working to preserve the Hocking River riparian corridor. This is a statewide organization for businesses that grow pawpaws commercially. ReUse Industries is a nonprofit organization that sells used materials and recycles as well. Rural Action is an NGO dedicated to improving the lives of the people of our area, with a special emphasis on environmental quality and sustainability.